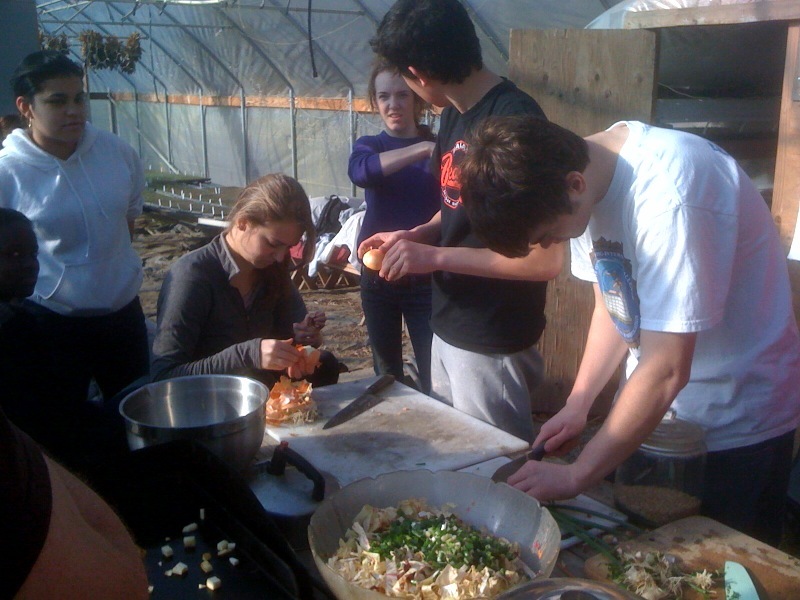 We had the kids hand weeding garlic, pulling dead cabbage stumps out of the field to compost, building a compost pile, transplanting spring leeks (yum), and finally, cooking lunch. Although I think 15- and 16-year-olds don’t have enough perspective or experience to really get what makes small-scale farming unusual, my hope is that exposure to these sorts of experiences might resonate as they grow up and do have to think about and consider their path in life and what is meaningful to them. More immediately, I really hope that having the kids cook something delicious and simple empowers them to start cooking for themselves. When I say that I don’t think 15-year olds have the context to understand why small farms like ours are important, the experience they lack is buying and cooking their own food and being forced to choose – cheap or healthy, convenient or difficult. For me, when I was first cooking for myself, those were difficult and frustrating decisions. So what’d we make? We sauteed some parsnips and onions and had that with The Best Winter Salad Ever, invented by Siri and Rand. I described it yesterday as random vegetable and bean salad, but if you wanted to put fancy pants on it, you could call it black chickpea and radicchio salad with winter vegetable slaw and tahini. It’s really good. We grew a variety of chickpea last year called Black Kabouli, that, unsurprisingly, is black. They taste pretty much the same as normal chickpeas, but their color really added to the beauty of the dish. Here’s a recipe, of sorts. 1. Cook chickpeas or other delicious bean. Set aside to cool. 2. In a bowl, add shredded carrots, and/or other slaw-able vegetables, i.e. cabbage, jerusalem artichokes, apple, etc. 3. Add roughly chopped radicchio to bowl. Cabbage would work too. 4. Stir in chickpeas, olive oil, rice wine vinegar, ground coriander, and a little tahini. Serve room temperature.